LOS ANGELES, Jan. 7, 2014 /Christian Newswire/ -- The sainthood cause for Fr. Aloysius Ellacuria, C.M.F. has just received a special gift for the New Year. Dr. Andrea Ambrosi, whose office is in Rome, will act as "postulator" of the cause. Dr. Ambrosi is "happy to accept the role of Diocesan and Roman Postulator for the future Cause of Beatification and Canonization of Fr. Aloysius Ellacuria, C.M.F." 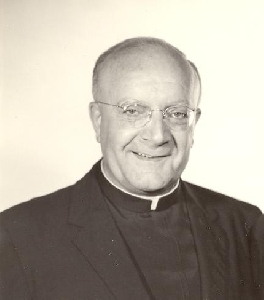 Father Aloysius was the well-known Claretian missionary priest who exercised a saintly ministry within Los Angeles, Phoenix, and San Antonio, Texas. Last year Archbishop Jose Gomez of the Archdiocese of Los Angeles lamented that he "lacked funds and canon law experts for a sainthood cause." While disappointing, a group called "The Friends of Father Aloysius" continued in its determination to "take up the torch" for the lengthy and costly process of canonization. "Securing the services of an experienced and recognized canon lawyer is a miracle in itself," according to Fr. Manion, "since there are very few experts in the field of canonizations." The postulator, as he is referred to, Dr. Andrea Ambrosi, continues to work on other well-known Catholic sainthood causes including, John Cardinal Newman who was recently beatified, Pope John XXIII, Archbishop Fulton Sheen, Frs. Stanley Rother and Emil Kapaun, and many others. Fr. Kevin Manion representing The Friends of Father Aloysius is delighted. "Although we still have many details to work out, including the financing," stated Manion, "today's announcement confirms we are on the right track."